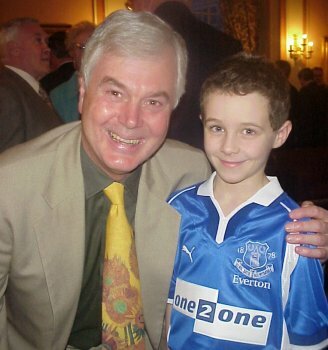 Another great night at the Adelphi Hotel began for me by taking my 9 year old son Lewis into the empty banqueting hall for a quick rehearsal in his new Everton kit, onto the stage where he was to help in the presentations as a mascot. David France showed him the moves:- bring the player of the year cup up to the front - and then Simon O'Brien will call out the nominations - then you pass it on to Alex Young who will hand it over. 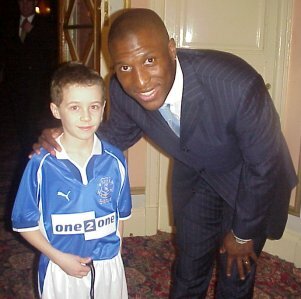 Then we went back to the players reception just as they began to arrive. On the the way through the deserted lounge (or World of Leather as Becky Tallentire calls it), there was a bloke crouching down getting something out of a crate. Then it flashed into view - the FA Cup. The minder called us over, 'What's your name son?'... 'Here Lewis, take this cloth - it needs polishing'. So while he fixes the plynth and backdrop, Lewis can't believe he is getting the Cup ready for display. The first of dozens of photos are taken, then we finally get to the reception. Old friends to meet, chatting to Martin O'Boyle and Mark Staniford from SFTH, Becky Tallentire looking very elegant, as Jimmy Husband arrives in a bright red coat. 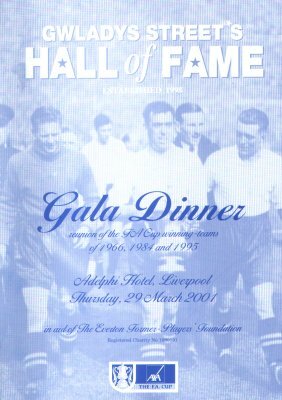 I chat to Alex Young about the testimonial - he is so honoured and was at pains to point out that half is going to the Players Foundation. On the subject of which, on the way in I had walked up the steps to the reception behind Gordon Watson, now looking solid on his feet following the operation funded by the foundation - last year he arrived in a wheel chair. 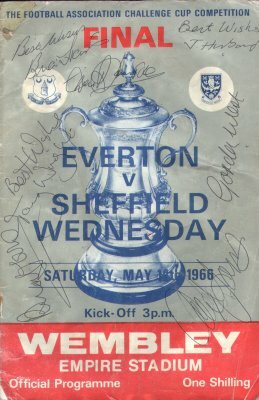 Labone, signing the front of my 1966 Cup Final Programme, turned to the page showing the photo of Princess Margaret and kissed her full on the lips. 'What a woman, great skin', he said. 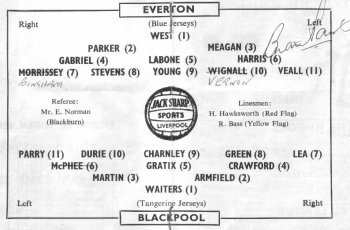 We tried to get more out of him but he wasnt saying, before telling us what he thought of Alan Ball, Bonetti in the 1970 World Cup, the state of the current team, and anything else we fired at him - there was no stopping him. I'd waited a long time to get these programmes signed! 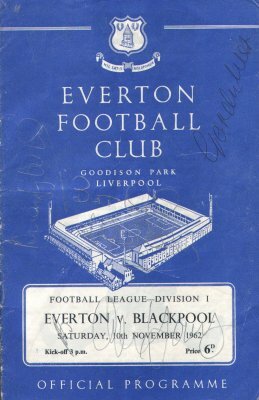 Below is the programme from the first game my Dad took me to. Amazing that half the team were at the Adelphi able to sign it. 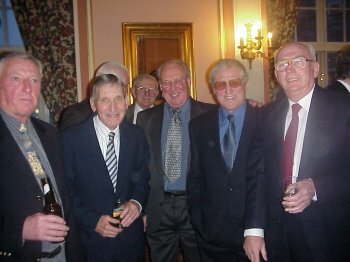 Gordon West, Tommy Wright, Alex Parker, Brian Harris, Tommy Jackson, Howard Kendall, Duncan McKenzie, Mike Pejic, Gary Stevens, Wally Fielding, Derek Temple, Derek Mountfield, Bill Kenright, Philip Carter, Kevin Campbell, Michael Ball, Richard Gough, John Connolly, Ferd Pickering, George Telfer, Dave Smallman, Dave Watson, Roger Kenyon, Henry Newton, Dave Hickson, Bobby Collins, John Bailey, Barry Horne, to name but a shed load, all milling around chatting to friends and fans, posing for photos and the endless signing of autographs. 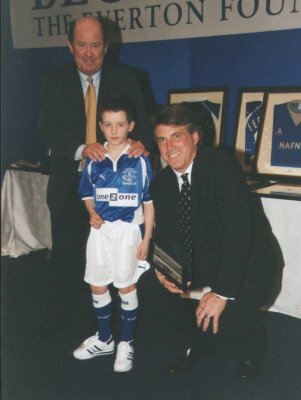 Lewis gets his picture taken with Kevin Campbell (right), Michael Ball (below) and Duncan McKenzie and can't believe what is happening to him. 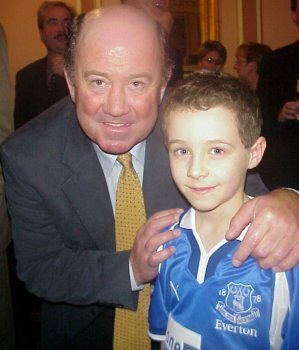 He poses with Howard Kendall who insists I take the photo three times as he didn't think he was posing correctly! I'm glad he did - the photo he made me take is wonderful - what a guy! Brian Harris crouches down and tells Lewis a few football stories of when he was his age, and Gordon West gives me a bear hug. There is no difference between Lewis and I - we are both nine years old. Into the Hall and to the tune of Z Cars, in come the players of each of the Cup Winning teams of 1966, 1984, and 1995, followed by Gordon Watson (a contemporary of Dixie Dean and a life long servant to the club) - walking in with the FA Cup. It is an emotional moment and the noise is deafening. 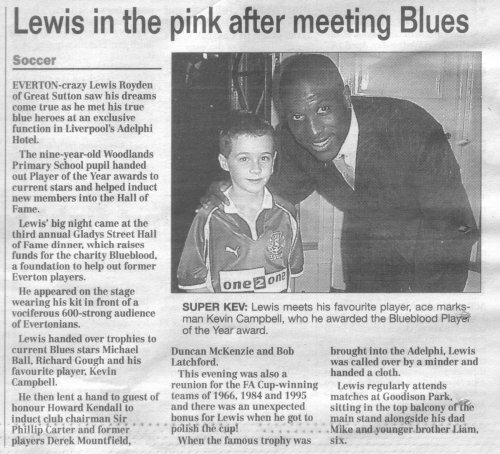 Now Lewis has to step up to the stage and bring the cups forward for the awards - not before Simon O'Brien gives him an unexpected introduction - 'Here to help me is 9 year old Lewis Royden, whose first game was at the age of two, he sits in the Top Balcony with his Dad and his favourite player is Kevin Campbell'. (thanks Martin O'Boyle - top script writer!). 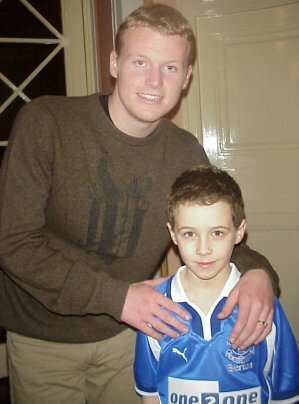 Simon includes Nicky Barmby in the nominations which goes down very well. 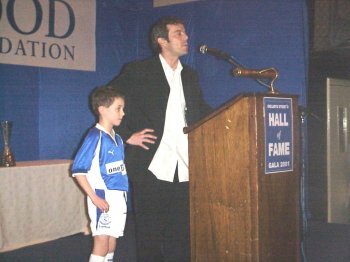 But thankfully, up step Richard Gough, Kevin Campbell and Michael Ball to receive Blueblood of the Year, Player of the Year and Young Player from Alex Young. Lewis (who is very shy) makes sure when it matters and carries out his job perfectly. This morning (the day after) he confessed he was shaking and couldnt feel his legs. 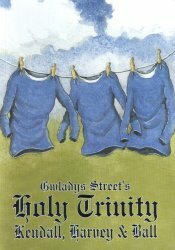 - This is no mild mannered respectable audience, (sorry!!) but 600 nutcase blues who raise the roof every time something remotely cheerable is mentioned. It's Crackerjack without the prompts. There's nothing else to cheer so this is the night to make up for it. So Lewis, you were a braveheart! 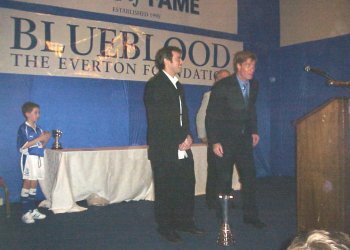 After the meal, he is back on again to assist in the induction of this year's additions to the Hall of Fame - Phillip Carter, Derek Mountfield, Duncan McKenzie and Bob Latchford (who looked fit enough to turn out tomorrow). Howard was presenting this time and I have this undying image of him with his arms wrapped around Lewis, looking after him, while each player took his turn to make his speech. Kendall even pushed him to the front and let Lewis hand the plaques over himself. Then the group photos with Lewis at the front, and I had to wipe the tears from my eyes. Sorry people, but it was an emotional moment! Thats my boy!! I'm so proud of him, but thanks to Dave France, Steve Milne, Becky (who made him feel so important) and everyone else who made his night - and mine. 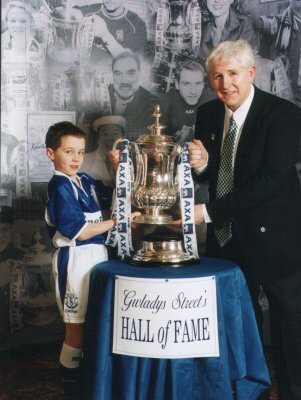 His Mum came for him at 11pm (er...school tomorrow), and still the night for the rest of us carried on, the auctions, then the Cup winning captains coming up to the stage to lift the FA Cup yet again (Brian Labone, Mark Higgins (for Ratters who was away with Shrewsbury) and Dave Watson). (This roll of film is still awaited). Then sitting around chatting with friends, players, and more bear hugs from Gordon West, then home by 3am. I then sat up and read the Holy Trinity (David France and Becky's book about that magnificent midfield trio) which we all received after the meal (and feeling a great buzz to be on page 75). A moment evocative of the whole event last night came when David Smallman took to the stage unannounced and declared that he had been invited to previous events, but was too embarrassed to attend as he felt he was out of place. This year he had be talked into coming - 'I only played 20 or so games, I was injured for four years out of five and I didn't think I belonged here, but everyone has made me feel so welcome and such a part of the whole event, it has been the greatest night of my life' - and we knew he meant it. 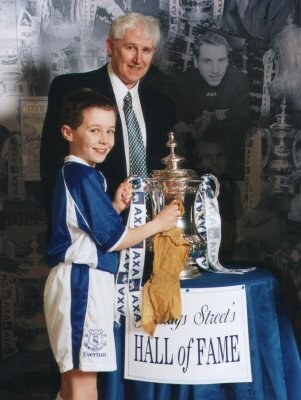 And so it was for this little fellow sitting here now, still in his kit, with his brother in his away kit looking at the photos of himself with his heroes. 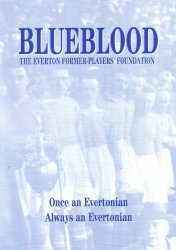 the Former-Players' Foundation and donation form.